shiner. is there any other beer? Anyone know if any (preferably Fort Worth) places have any pumpkin ales on tap this time of year? Or even if you can buy a six pack anywhere. I've heard great things about Pumking and I really want to try it. Had a Pacifico in Cali for the first time. they've started selling Yuengling here in nashville. great beer. I get it every time i'm up in Philly. Anyone else (U2?) enjoying the perfection in brewing that is Sierra Nevada Celebration? I already have 3 6 packs.... waiting their turn for Thanksgiving, Christmas, and New Years. Funny, I normally drink Heineken or Guinness or Sam Adams. I really don't enjoy Bud or Bud Light. But I am trying to save some money, so I bought a couple of Miller High Lifes and I am drinking one now. Not too bad for so cheap! I have never had one that I have known of! Last edited by Evilmav2; 11-09-2007 at 08:31 PM. Where can you pick this up? Do I need to go to a liquor store? I had some at a B.J. 's brew house last year, and really enjoyed it. Ah yes. The majestic. I work very near there. Indeed. If you are a beer lover, this place is like Nirvana. Not only do they have the best selection I have been able to find in Dallas, but they always have excellent specials. For example, the lovely Paulaner Salvator was going for $6.50 a couple weeks ago, down from $9.49. They seem to always have a twelve pack of something good for anywhere from ten bucks to thirteen or so. The Spaten Oktoberfest is presently something like $10.50, down from about $16. Newcastle Brown Ale is at the same price, if that is more to your taste. Basically I just try whatever they have on sale, which broadens my range of experience at the same time it fattens my wallet. The best of both worlds! Well..... I know for certain that Goody Goody in Highland Village has a ton of it because I saw them unloading some not but an hour ago (maybe 2 hours?). It will go pretty quickly if it follows past years. I miss how it was years ago when it wasn't as well known and you could find it pretty easily. I use to live about a mile away from there on Valley Ridge, for my senior year at UNT. They used to know me there Seriously. 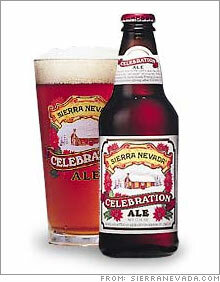 Sadly, I have not seen the Sierra Nevada Celebration Ale on the shelves at my local haunts. I suppose I may not be looking hard enough. I have seen, and indeed imbibed, the Sierra Nevada Anniversary Ale. But now I will be on the lookout for this other fine brew. I had Shiner Hefeweizen by mistake a couple of weeks ago. I found it at the Goody Goody in The Colony today. I better go grab some of this stuff today. Tell me, good fellows, a bit about this beer. What other beer is it like? I am assuming it is a seasonal brew, correct? It is a seasonal brew, and it's an American IPA. You mentioned that you had their Anniversary Ale, which isn't all that different, really. Celebration just seems a bit more flavorful - more hops and a slightly heavier malt profile. I'd say it's similar to St. Arnold's Elissa IPA and Victory's HopDevil. So a few years ago i went to this thing called "brewtopia", it was in new york city, and i guess they have these festivals annually or bi-annually. Anyway, its basically a huge convention center type room with booths of people that brew their own beers, from big companies to little mom and pop shops. They give you a little 4 oz shot glass to sample beers, believe me my 15 friends and I put a dent in some of those booths. 4 oz's at a time. So i found this one booth that i absolutely loved. I don't remember the brand but it was a sour beer. I remember it being lighter in color, almost orange. And it was about 6% alcohol. I would drink it and afterwards a slight sour taste was left. It was great! Anyone have any ideas?, or any thoughts? Anyone enjoy sour type beers? Anyone been to or heard of brewtopia? Sounds like a Belgian style to me - a lambic or gueuze, maybe a saison. Any of those styles sound familiar? I remember it being lighter in color, almost orange. And it was about 6% alcohol. I would drink it and afterwards a slight sour taste was left. It was great! At first I was thinking piss...but probably not. Just kidding. I love a good sour taste, too. i just googled those terms and found a website about belgian beers. I honestly don't remember. I wish i did. I just remember those guys got tired of pouring me beers, cause i was the only guy hovering around their booth for like 45 minutes. You think you're pretty smart, don't you, Trebek? What with your Drago mustache and your greasy hair! At first I was thinking piss...because i like it. Last edited by MavsX; 11-10-2007 at 06:50 PM. Thanks. I just knocked one of these babies down. It did feel a bit different from the Anniversary Ale to me. As you say, more flavor. Feels almost like a hugely hopped up lambic. Lots of berry flavors. Also extraordinarily carbonated. Did I mention hops? Great brew. Thanks for the recommendation, guys. Luckily, I get to "celebrate" five more times! And heavy, and bitter. But it's nice. I can see how this would be better on a cold night. i bought a 6 pack of sierra nevada pale ale tonight, due to the above conversations. I would be very, very surprised if Goody Goody beat Majestic in terms of selection. Majestic has about thirty feet of cooler space on imports. You are lucky to find fifteen feet anywhere else. Even at the overly hyped Central Market, you don't get the same selection. Of course, if you guys are talking spirits, I can't comment. I only buy the beer. MavsX, good luck with the SN Pale Ale. Report back in an hour or so.